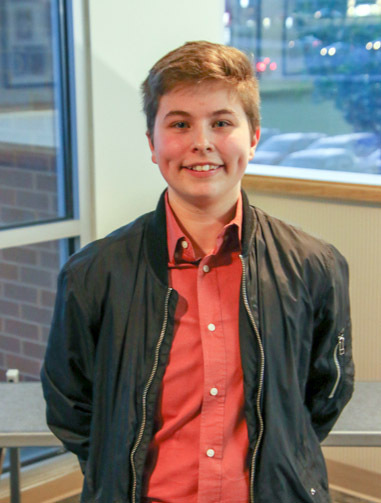 Read about the students and staff who were recognized at the April 10 Board of Education meeting. 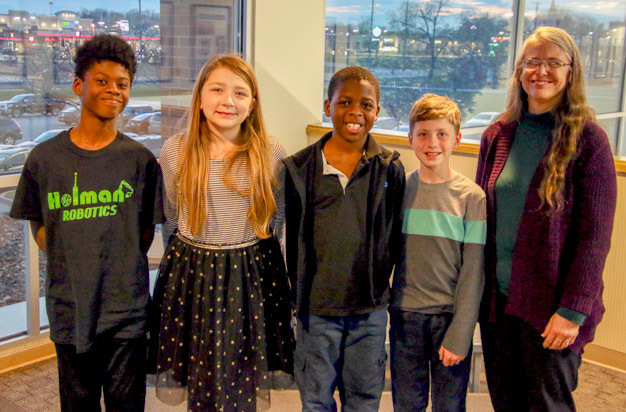 Two students in the PEGS (Program for Exceptionally Gifted Students) program at Remington were selected as winners of the annual Law Day Essay Contest. 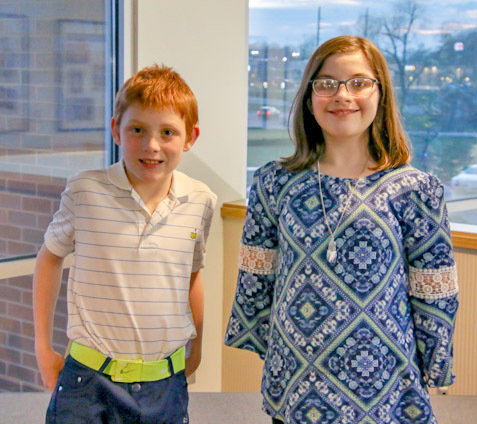 Fifth-grader Audrey Dallape placed second and fourth-grader Daniel Clifford placed third in the fourth- and fifth-grade category. Their essay focused on the powers, checks and balances and origins of the three governmental branches. 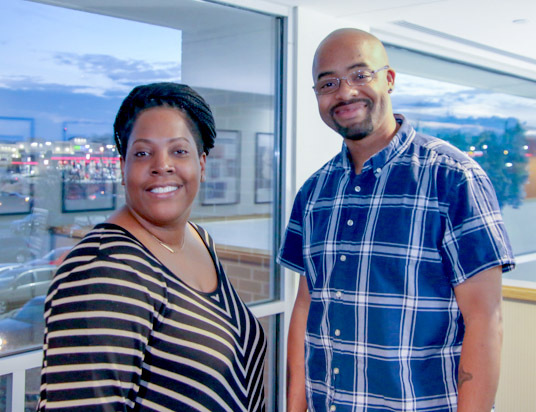 The contest was sponsored by the Missouri National Education Association and the Missouri Bar Young Lawyers Section. Members of the fifth-grade project-based learning class at Holman Middle School competed in the Vex robotics competition after earning awards at the 4H Dolphins Tournament in the fall. The Pugs Team won the STEM project award at the qualifying tournament and advanced to the Vex State Championship where they won the Judge’s Award Trophy. The team is comprised of Mark Dwyer, Lance Fajardo, Bryan Manjarrez, Logan Monroe, Dezmond Stone, Elliott Womack and Tommy Wulf. The STEMbots team earned the Team Alliance and Excellence Award at the 4H Dolphins Tournament. The STEMbots are made up of Matthew Cutrell, Noah Griffin, Adam McNealy, Anastasiya Richardson, Matthew Schiermeyer, Donald Simpkins and Isaac Whittinghill. Teacher Cheryl Gragert coaches these students. Randy Hartmann, a junior at the high school, completed the U.S. Equestrian Athlete Lettering Program. The program recognizes the accomplishments of young equestrians and their dedication to preparing for competitions. To complete the program, students must have at least 100 hours of riding or training and have competed in three competitions. 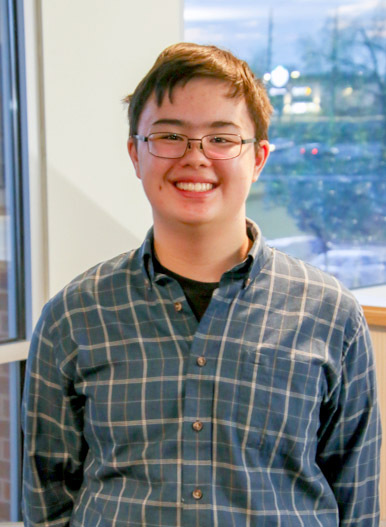 Junior Alex Newett earned a national silver medal in the fiction and fantasy category of the Scholastic Art and Writing Awards for his story “Comrades in Arms.” Nearly 350,000 works of art and writing were submitted and National Medalists represent less than 1 percent of submissions each year. The Scholastic Art and Writing Awards recognize the vision, ingenuity and talent of America’s youth and provide opportunities for creative teens to be celebrated. Only 20 students from Missouri earned national recognition. The Pattonville robotics teams completed their season with both teams qualifying for state and one team for the Super Regionals competition. Team 2867 is comprised of Clayton Austin, Greg Bahr, Slena Caldwell, Kaleb Gines, Ian McKeown, James McMahon, Summer Miller, Alex Morschl, Yasaman Mostafavi, Zane Scott, William Skaggs, Kevin Stewart, Stephaun Turner, Ben Wingerter, Jenny Wingerter and Kyle Wright. They competed in the FIRST FTC South Super Regional Championship, which is comprised of the Top 7 percent of teams in the world. To advance to super regionals, the team competed at the Missouri State Championship, where they earned the Control Award, second place Think Award and third place Inspire Award. Prior to this, the team competed at the FTC Qualifier at St. Louis Community College - Meramec, where they earned four awards and was the Winning Alliance Captain. Team 7856 is comprised of Alex Duello, Cole Dunsford, Colin Heidemann, Brendan Hilligoss, Tajh Martin, Erin McMahon, Kyle Murphy, Michael Pieper, Scott Rhinesmith, Steven Seibert, Dan Trieu, Colleen Tyarks, Sam Vaclavik and Cory Williams. The team also competed at the Missouri State Championship after earning four awards at the FTC East Conference qualifier, including being the winner of the Motivate Award and the second team picked as part of the Winning Alliance. At the Meramec qualifier, the team was the winner of the Control Award. Teachers Sue Mathis coaches these students with the assistance of mentors Brian Bateman, Charlie Hall, Gary Mathis, Carl Miller, Colin Shipley, Doan Trieu and Rick Wingerter. 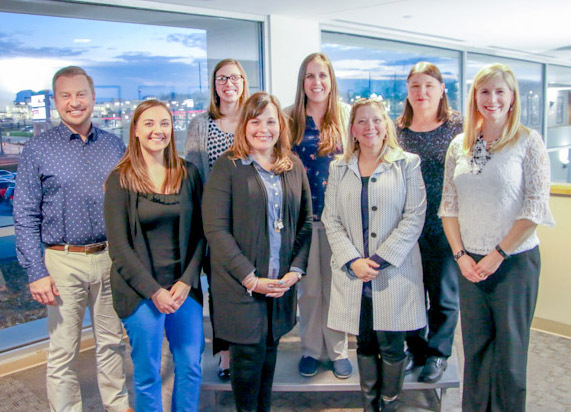 The following educators were named the Teacher of the Year for their schools: Sharon Wood from early childhood, Emily Lerman from Bridgeway, Nicole Dye from Drummond, Kimberly Dannegger from Parkwood, Mary Spitzmiller from Rose Acres, Jennifer Bober from Willow Brook, Kelley Dent from Remington, Jennifer Calva from Holman, Tracy Baker from Heights and Amy Schwendemann from the high school. The following staff members were named the Support Staff Employee of the Year for their buildings: Cheryl Norfolk from early childhood, Renee Davenport from Bridgeway, Tamika Duncan from Drummond, Angela Barringhaus from Parkwood, Amy Reese from Rose Acres, David Duncan from Willow Brook, Jeannie Jones from Remington, Shannon Hill from Holman, Rodney Spann from Heights, Heidi Lanham from the high school and Tron Williams from the Learning Center representing the district services group. From Pattonville High School, Michael Boulanger (POSITIVE School), Ryan Brueckmann, Kaitlin Childs, Lori Cole, Nathan Dwyer, Steve Edler, Mary Favazza, Katie Fitzpatrick, Katie Funderburk, Trista Giubardo, David Gross, Sarah Guilfoyle, Twila Harris, Scott Hauser, from the POSITIVE School, Brian Heyman, Silvia Hilker, Haley Hunter, Jake Kim (POSITIVE School), Nathan Klosterman, Juli Kobielusz, Lisa Kraus, Rob Lamb, Darrell Langston, Holly Martinez, Emily McDaniel, Beth Moritz, Edna Nichols, Tracie Olson, Natalie Passarelli, Alysia Patterson, Donna Schmidt, Jeremiah Simmons, Justin Smiley, Melissa Sparkman (POSITIVE School), Anna White, Kara White and Robin Woodrome (POSITIVE School). From the district services group, Annsley Bishop, Melanie Bolden, Becky Buckley-Baker, Marilyn Sue Collier Brannin, Stan Greer, Beth Hathaway, Mike Johannes, Cora Johnson, Danielle King, Vonnie Mack-Haley, Alicia O'Neal, Kim Schneider, Annedra Turner, Brenda Vitale and Lois Westbrook.